Playground sessions piano. An in-depth review from a real, active user. Annual package $ 119.88 for first year. $9.99 per month thereafter. ($20 in free songs). Lifetime package $269.99 ($40 in free songs). Members price for additional songs $3.99 in all three packages. What you get as a subscriber? Highly efficient and good quality learning tool. Modern and classical songs as you learn techniques. and feedback of your accuracy. Main core of the course is good value. 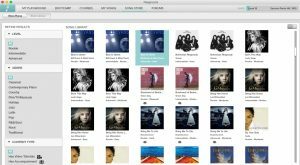 Cost to buy additional songs may not appeal to some. Playground sessions course content and structure. and earphones I was all set. “Bootcamp” option and chose the beginners section. In Playground sessions, you will find 78 lessons in front of you which you download one at a time. Some of these are video tutorials with the teacher, but most are lessons built around a song. The lesson will have a number of parts varying from a few to six. You click on the part and you will hear a count in, before the piece starts. You can adjust the tempo if a piece is difficult. Sometimes there is a brief verbal narrative at the top of the lesson explaining the piece. In a similar process to Yousician, there is a count-in and the song commences. You must hit the required note in time with the piece. Unlike Yousician, there is no option, but to learn traditional music script. If this is not your aim, then you may prefer learning via a different medium such as Shawn Cheek’s webpianoteacher. However, the music learning is not daunting and is built upon very slowly – learning a few notes at a time from the Treble Clef (generally played with the right hand) and Bass Clef (generally played with the left hand). I like the way the song is built up slowly with more notes being added with each part. It’s also a good challenge to aim for that perfect score of 100%. At the end of each part you are presented with a % of accuracy and colour – Green is a pass and you can continue to the next part. Amber or red is a fail and you must start again. This feedback is essential. 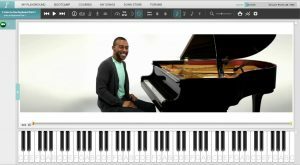 I have mentioned before that having a one-on-one teacher is the best method to learn piano, but if that is not available, having feedback from a machine or tool like Playground is the next best thing. The song choice is good with a mixture of pop and classical pieces for the beginner to accompany. Beethoven’s “Fur Elise” and many more. Not a nursery rhyme in sight, which is great. To reiterate, with these early songs, you are not generally playing the main theme – more of a simple accompaniment to get you familiar with reading music, learning the notes on the keyboard and keeping in time. Boulevard of Broken Dreams…. to name a few. The song section boasts over 500 songs. These can be purchased for $3.99 each or $5 for non-members, but most packages have a song or two included. My first reaction to this was negative. Why should you pay extra for additional songs? Other sites, such as Shawn Cheek require no extras once you are a member. However the songs on Playground sessions are more than just the sheet music. The song will move as you play and you will be assessed on your accuracy, so you are getting instant feedback. This motivates you to improve and nail a better score each time. You’ll obviously not get any feedback on feel and the dynamics you put into the song. Once you are familiar with the piece, it’s a good idea to record yourself and hear how it sounds. So what do you get for $3.99? You get access to the interactive piece (with audio), the printed music (3 prints per purchase) and lifetime access to the song via Playground sessions – assuming you are a member. Even so this is an extra cost that may put some people off. There is a third category by “Lesson type” which will split songs with Video tutorials and those songs that have accompaniments. At the time of writing there were 31 songs with video tutorials at various abilities. and many more including classical, films and shows. It’s an exhaustive list which will keep you busy for some-time…. And will cost you a lot if you bought every piece! Each piece is also described as Easy, Moderate or Hard, even in the Rookie Section, to give some further guidance. When you click on a piece you are presented with a one page preview of the sheet music and an audio preview of the piece. I clicked on “Don’t stop Believin” from Journey and listened to the preview. This is a simplified version of the song with a bassline and the vocal melody both played on the piano. However there are more detailed versions in the Intermediate and Advanced sections. The audio previews both the piano part and the piece with the band accompaniment. I was impressed with the production and standard of the song – I can play the piano part already, but the advanced piece adds to the difficulty with an enhanced vocal line played on the piano during the verses and chorus. So, again, although you are paying $3.99 you are getting more than just the sheet music. Intermediate and advanced songs include enhanced versions that are found in the rookie section. So in theory you could buy more than three versions of the same song. “Don’t stop Believin’ ” is available as Rookie Moderate, Intermediate Easy, Intermediate Hard and Advanced Moderate – so nearly $16 if you bought all four. Some songs have even more versions…. I think this could be improved. If you wanted to start from Rookie and progress through all abilities, perhaps a discount could be available or they could be bought as a package? To summarise the Playground sessions catalogue available, the production quality and the learning process the songs give you are impressive, but I still feel uncomfortable with the extra cost and hence cannot give 5 stars for value. Others may disagree and say $3.99 is good value for a single song with the enhancements you receive, but my point is, these costs can add up over time. 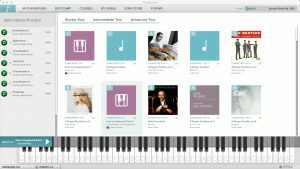 Still cheaper than a private tutor sitting with you going through a piece of music? I guess so. One for the individual to make up their own mind. Click here to see the full range of Playground sessions songs. The quality of tuition is very professional with a solid curriculum. Arrangements are interesting and a good challenge keeping you motivated to progress through the course. Quincy Jones is a legend in the music industry with a long list of credits and Grammy awards. I guess he is most famous for being producer on Michael Jackson’s three most iconic and successful albums. For him to put his name to anything, it gives an air of quality. The main teacher is David Sides who you will see and hear throughout the course. I wasn’t aware of him until Playground session and his talent is impressive. The link above will show you 4 of his arrangements which are worth a listen. His teaching style is relaxed and informative. He speaks slowly and gets the facts and techniques across very well. His arrangements are also interesting. Other involvements include Alex Ness, David Gracia and Dr. Bryon Adams and details can be found at the above link. Playground sessions – a worthwhile course. I can’t help but like Playground session’s main learning tool and core. I prefer it to Yousician although there are some close similarities. The arrangements are good and will keep you motivated. You have no choice but to learn to read music at the same time as you learn the piano, but don’t let this put you off. It’s built upon very slowly learning only a few notes at a time. You will be playing an accompaniment to a well know piece of music with the added motivation to hit that perfect score. You are also notified via a ping when you reach a new level. I like this feedback and the motivation to reach 100%. The content will keep you busy for a long time and I think the core package is very good value. However, the main reason I cannot give this 5 stars is the additional expense of the songs. When you purchase an additional piece, you are buying more than just the sheet music. You have an accompaniment and feedback to your accuracy. Taken in a single song, this is valuable, but if you were to purchase all the songs, the costs will mount up. Maybe I’m being a little harsh, as buying all the songs could be over a few years, so the costs may not be noticeable. There are also sales and discounts at certain times. Another added feature is the option to buy a keyboard package together with your subscription. This is aimed for at the U.S market it appears. Do your homework and compare costs of the keyboards before committing. 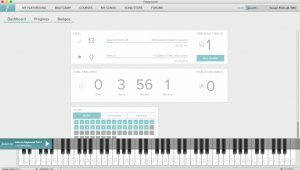 It will still take a piano student effort, time, commitment and perseverance to master the piano, but Playground sessions is a high quality learning tool with excellent tuition covering most of the necessary skills and techniques. With a huge repertoire of lessons and songs, it makes a worthwhile investment. Click here to visit Playground sessions. Hi Dave – Thanks for your review. I’m just looking into Playground Sessions at the moment and your review was very helpful. This might be a dumb question, but am I right in assuming that the songs earlier (such as the Beatles’ “I Love You’) come with the lessons and that you only pay extra if you want to choose additional songs? Hi Nola. Thanks for your kind words and glad you found the review useful. Your assumption is correct. Most lessons are based around a song to demonstrate the theme that is being learned, whether learning to read music or learning a rhythm technique for example.